Ty Unglebower | Writer. Actor. Introvert. What Rung on the Ladder is Your Character On? Everyone is part of, and interacts with, organizations, institutions, groups and so on. Whether realistic or fantastic, narratives usually require at least some mention of social-political orders, large or small. What rung on the proverbial ladder are your characters on during the course of your story? I stumbled upon a website this weekend that makes for a useful starting point for answering that question. It appears to be infrequently updated, and isn’t the most academically rigorous source of information. It may however, as it did for me, act as a solid quick-reference when detailed research is not required. I’m not being compensated for mentioning it, or anything like that. Just passing along what I found. Hierarchystructure.com is exactly what it sounds like. While not the smoothest-sounding web address, it provides charts and brief descriptions of power structures and office positions for scores of different institutions and organizations. For example” churches, large companies, police forces, sports leagues, and so on. We lend realism as needed to our fiction when the appropriate levels or offices of an organization are utilized throughout the narrative. The term “archbishop” sounds dramatic, and lends a certain gravitas. Yet, if your story is about a suspicious private detective confronting odd activities in the local, poorly funded urban Catholic parish, he’ll be interacting with the priest, and possibly only the deacon of the parish. If you’re character is confronting an Archbishop in person, the scope and scale of your narrative needs to be much more significant, political and, depending on the type of novel, dangerous. The site isn’t a source for in-depth scholarly research, as I’ve mentioned. But for a quick reference to any number or organizations (with colorful charts!) you could do worse than bookmarking this site into your author’s toolbox. We live in an ugly time. White supremacy is emboldened again. Modern Nazi groups, if not at the table are at least allowed in the room. Blase violations of the civil rights of children at the border, (and certainly beyond.) Rising Islamophobia. Homophobia. Rejection of science. It’s a modern Dark(ish) Age, and I do in fact assign a great deal of the blame to Donald Trump and those that support him. I have said as much here on my website, calling out bigotry, and I have done so on my Twitter account. I’ve not found that this path leads to more literary success so far. But even if there were a stronger body of evidence that it would, I’m not sure I could maintain my silence in such ugly times. Was it not silence on the part of the intelligent, the observant, the artists that allowed the door to open on any number of dictatorships in our (not so distant) history? Do we not become accomplices before, during and after the fact when we tiptoe with care around the fires that are slow-burning society to the ground, cautious so as not to raise eyebrows at the book signing? Am I damaging my brand, my possible sales, my reputation among potential readers by actively observing and and responding to what I see as human rights issues, and other “political” events? I’d love to think that I wasn’t, and that my books have merit in their own right. Yet even if I am wrong, and I am shooting myself somewhat in the foot, I would no doubt damage myself more by saying absolutely nothing in days such as this. It would be impossible for me to be who I am, an author, and totally silent about non-writing issues at the same time. What can I tell you? It doesn’t make me any kind of hero, but I cannot be a bystander either. In case you missed it, below is my new profile picture for this blog’s front page. I took it just a few days ago, backstage at the Black Box Arts Center, where I am currently appearing in a production of Henrik Ibsen’s An Enemy of the People. It earned first the honor of being my Facebook profile pic, for all my friends to admire. But then I made it public as my Twitter profile, and now here on my own website. It’s not only well-composed for a selfie, but it represents several things about me all at once. You see me off stage here. I am in my costume, but I am not yet “in character,” because the rehearsal had not yet begun. That is to say, here, it’s still just me being me. But the costume, and the location represent of course the actor side of myself. 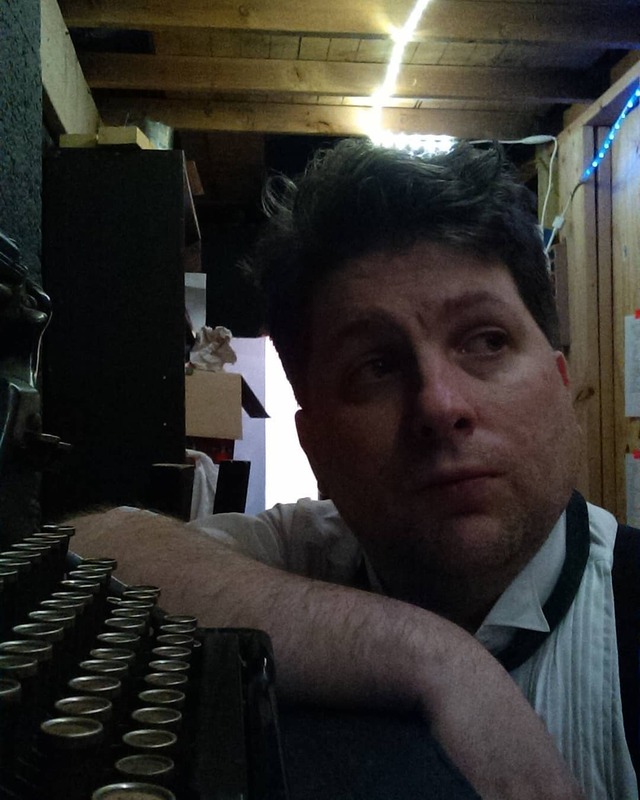 The typewriter is a prop I use in the show. It too is part of the theatre aspect of me, but of course is a well-established symbol of the writing profession, even if I don’t, and never have used one for my work. And yes, I play a writer/editor in the play, by the name of Hovstad. And I am off by myself in the shot, of course. Theatre is rarely a 100% solitary activity, but I make sure to take time to myself while doing it, just as with anything else. So my introverted nature is also reflected here. As a bonus, I’m not even making eye-contact with the viewer…a nod perhaps to both my introversion and my place on the Autism Spectrum. It’s important to note that I planned none of this deeper imagery when I took the shot; I just thought me standing next to an old school typewriter would look cool. But it captured so much more than I planned, I couldn’t keep it totally to myself. That happens once in a while. Intriguing that it happened at nearly the exact same time last year. And if all of this talk of pictures and imagery didn’t have enough levels to it already, I’ll mention one more metaphor that is less obvious when looking. I hope the entire idea of creating something just because I thought it would be fun, only to have it transcend all my plans and radiate unplanned positive effects will occur in my writing as well.